Yes, the title of this post is taken from an old OMD record. This record is brilliant. And OMD used to be very cool, you know. If you don’t believe me, go ask, er, OMD. Dazzle Ships was another one of theirs – the follow-up to Architecture and Morality, in fact. Great name for a blog, may I say. Now the hitherto unseen link between agencies and architecture is made in your minds, let’s play with that association for a little bit. Agencies are designed, of course, with a purpose in mind. They house a load of people and resources. They are the physical embodiment of some abstract beliefs and points of view on the world they inhabit. And different types of agency go in and out of fashion. We all remember the baroque period of the 1980s, of course. But more fundamentally (or perhaps just less flippantly), buildings and agencies each tell you something about their values from the way they are designed and used. Architecture and Morality, you see? And listening to a talk recently from former RIBA President Sunand Prassad, even more connections started to reveal themselves. The ‘new’ soon becomes part of the ‘old’, and the built environment is an “unfolding drama in which we all play our part”. I like a lot how the life of an agency could sound like that. ‘Wisdom and inventiveness.’ How good is that? This mutable, organic, crowd-sourced view of architecture makes for two interesting parallels with agencies, I think. Agency output: increasingly, as architects of consumer experiences, agencies are trying to build ‘unfolding dramas’ of their own, with communication products that are fuelled, propagated and enhanced by the users of those products, not just their designers. Agency construction: agencies remain only as vibrant and as buyable as the people they employ. Everyone has to ‘play their part’. The question is, how to effectively harness the disparate talents required these days. This all sounds like great abstract theory, but the more I looked at specific examples the more the comparison seemed to hold. Some broad themes struck, captured below. Public consultations have long been part of the dynamic of planning and building. Often they can resemble a pitch process, where suppliers are whittled down based on initial ideas. The most popular doesn’t always need to be chosen, though, and early testing of designs can lead to improvements of less popular propositions that better answer the problem. Should what we do be appealing as well as effective? Probably. But a world where effective wins out is one I’d like to work in. Another way to involve the publis through the new trend of Masterplans, where rockstar architects come up with showstopping plans for a big complex, or even a town. This allows citizens to evaluate the big idea in abstract, purely as bold ambition. They can then assess whether the constituent elements (often developed by smaller, grittier practices) matches up to that ambition. The recent attempt in Barnsley to create a Tuscan village style environment is a perfect example. Bold ambition followed up by gritty, planning-based projects by smaller practices. Sounds far-fetched, but it helps to envisage a future for the overall project, and helps define the direction everyone is going. In a world where brands are increasingly owned (or are perceived to be) by their customers, this big-picture consensus could be an interesting direction. You could see a Starbucks, M&S, or smaller, more local brands asking their own customers to hold them to account. As our world becomes more complicated, the stuff clients appoint agencies to do will become broader, deeper, newer. Agency excitement at innovation will continue to correlate closely with client confusion – largely fuelled by us, of course. More than ever we will need to bring clients with us, and architecture has found interesting ways to engage clients in the decision-making process itself – from brief through to initial design and execution. With the Sorrell Foundation, Sir John and Lady Frances Sorrell have engaged children in the design of their own schools. Their approach is to help turn the students into what they call “inspired and informed clients.” A re-design brief for a school canteen might see them taking the kids to restaurants and fast food places. Brave stuff, perhaps, to let clients take a peek behind the curtain. But the rules are changing. Many agency skills, even (especially?) new ones like buzz monitoring and community management, are being taken in house. I believe we maintain greater influence by ceding control a little where necessary. After all, it’s a lecture we’ve been giving clients for some time! Turning insight into ideas will always be what we do best, allowing into the process the people who pay us can only demonstrate that. In the 1850s and 1860s, Napoleon III and the great moderniser Haussmann renovated Paris in a way that completely cut a swathe through the old city that had remained pretty much intact since the Middle Ages. 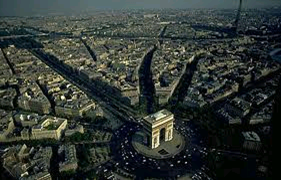 The famed boulevards that now sweep up towards the Arc de Triomphe were revolutionary, and certainly a grand statement. Haussmann made the roads wide, the buildings broad, and the spaces open. But if anything these choices were anti-revolutionary. Having been plagued by rebellion and disease, the French authorities had found it impossible to maintain order and sanitation amid the narrow and winding back streets of the old city. So everything was brought out into the open. Dissidents had nowhere to hide. Haussmann had realised the wider the street, the harder it is to barricade. I imagine every agency has its own back streets. Most likely with people hiding away, trying not to get found out. And able to remain hidden because no-one really wants to go looking for the problems. The modern agency, because everything moves so fast, needs to be transparent. It needs to have people unafraid to suggest new ways of doing things. Like the new urban setting Haussmann created, it needs to provide a stage for people to parade their talents and be recognised. Sunand Prasand (remember him – I mentioned him ages ago in the intro?) reckons we need to overhaul the mindset of the (town)planning system. As the main interface between the public and decisions made regarding the built environment, it should exude a positive, optimistic attitude. Of course, it doesn’t do that at all. It really functions as a form of ‘development control’ – effectively a means of stopping things happening. Prasand instead envisages a system focused on ‘plan-making’, where “the imagining and working out of the future of our area” is an empowering, engaging experience for planners and users. Where consensus is reached, and citizens could have a a “framework for what sort of development is welcome, and where”. When applications are made in line with that framework, they are approved. Simple as that. Wouldn’t that make decision-making easier for us too? Not necessarily within agencies, but certainly perhaps with clients. An agreement about what kind of ideas are right and wrong, based on criteria and priorities, arrived at through a decision-making process of rationality and, yes, sacrifice? This is planning, and yet so often, like its building equivalent, it’s done with almost no institutional memory whatsoever. And it’s done repetitively, treating each individual issue with the same subjective opinions as the last one. I bet most brands and clients have some perennial problems that they’ve been dealing with for years and years. Why aren’t they fixed yet? Because we didn’t fix them last time. Because we’re note quite sure what we want. Or why. So, that’s my quick tour around architecture – a world I know nothing about, but which upon first hearing about seemed to resonate with so many facets of our own agency world. If nothing else, it certainly got me thinking about some of the questions facing us as agencies right now. What sort of experience do we want to build – for ourselves, for our clients, for users? How should our constructed environment change as the world changes around it? How do we harness the involvement of people who have a part to play? I will be speaking at the next Google Firestarters in a week or so, on some of these issues. It’s been really helpful writing this ahead of the event – any thoughts and observations would be much appreciated to help formulate them further. James, firstly excellent post. By drawing the parallels between architecture and planning was something I was exploring a few months back (apologies for self reference and excessively long title http://bit.ly/iDIuhG). In the case of Hedonistic Sustainability Architecture, the focus is creating a viable ecosystem that balances people and resources effectively without compromising the aesthetic. I would hope that brand planning similarly tries to address the consideration of people and ideas without compromising the aesthetic. It’s worth reminding that the majority of architecture continues to be moribund (IMHO) with the odd smattering of high points. Which is not too dissimilar to brand campaigns. Look forward to your presentation at Google Firestarters and catching up with you. I think you’re right when you mention the need to balance the functional and the aesthetic. After all, it is ideas (in the broadest sense of the word) that people get excited by, not just whether something will work or not. Perhaps the aesthetic and the behavioural is a better juxtaposition? And yes, the hit rate is yet another similarity!